Being a trainer and in the fitness industry, I read and hear a lot of the push push push talk. I am the first to admit, I push all the time. My clients, my kids, my husband and myself included. I have a pretty rigid plan for myself and I don't stray from it...ever. This makes me less forgiving on myself and really not good at spur of the moment types of things. Over the past couple of years, I've been working on being a little more easy breezy when it comes to plans. I'm sure having babies didn't help me in the going with the flow mood, but now that they're older, I'm getting better with it and can't blame them for my rigid behavior. The other problem I had with letting things go was with food. When you have a restricted diet with allergies and intolerances, it makes you a lot less easy going when it comes to going out to eat. I have since overcome that by not being ashamed to bring some food with me when we go places. I typically order a salad and then bring some embellishments to make it a complete meal. 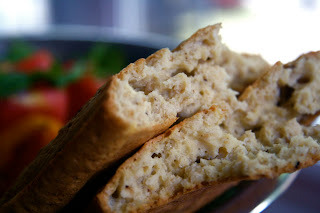 My protein loaded flatbread and some nutritional yeast make me a happy girl when I'm heading somewhere I know I will be limited to a side salad. The other problem I have is budget. Yeah, I'm a stickler for keeping our costs down as much as possible. We work for ourselves and, truth be told, it could be feast or famine (good thing we all like beans here). I like to eat, I like having a roof over my head and I like providing for my kids. So, I'm always asking how much everything is before we do anything. This all has a point...I'm getting there, I promise. So, a couple of weeks ago, I was working on a Saturday morning. We have one car and Tony came to pick me up at 1:00. He asked if I minded if we went to the store for a few things. I love the grocery store, so yeah, we can go, but what did we need? He said he wanted to treat us all to banana splits during our movie that night! We were all so down after his uncle had passed away. Everything seemed gloomy. Life was just not fun at all. I told him the kids would love that! We hadn't had them in years, so it sounded like a fun change. We walked into the store, started getting everything and then we walked over to the ice cream section. Immediately, Tony walked over to get me some too. I saw the price and my heart sunk. I told him I would come up with something else to have when everyone was doing the ice cream thing. It was just too expensive for the dairy free ice creams. I told him not to worry, I would do some sort of banana treat for myself too (since we can't always eat the same thing, the guys all seem to love it when we can eat the same). He told me he really wanted to do this for all of us. He opened up the freezer and grabbed me some SoDelicious Coconut Vanilla Ice Cream. I just felt guilty. I didn't want to spend the money. He looked at me and said everyone needs a treat sometimes. Gosh, was he ever right. I never let myself just give in and enjoy something totally ridiculous. I realize it was just ice cream, but for some reason, the act of what we were doing felt incredibly freeing and fun. A feeling we all needed badly! We got everything we needed for our banana splits and walked out. On the way out of the store, I asked if they had eaten lunch. It turned out that none of us had eaten lunch yet. I then looked at him and asked why don't we have banana splits for lunch? I figured if we were going to have some fun, why not go all out? 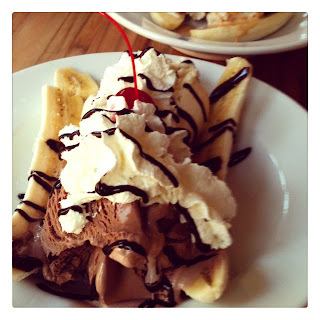 He agreed and when we called the kids down for lunch, they were shocked and excited to have banana splits for lunch! We had a blast that afternoon by simply letting go and acting like kids. Tony called it "Treat Yo Self Day". Everybody really could use that kind of day sometimes. I think we are due for another "Treat Yo Self" kind of day! Do you ever do that? Treat yourself to something that you normally wouldn't? If you have, what was it? For me, this was not about the food, but more the act of doing something out of the ordinary. Kind of like when we got the boat. Sadly, it's too cold for the boat, so banana splits were definitely a nice alternative to the salad lunch I had planned. ;) I highly recommend dessert for lunch! Acting like a kid in a candy store really does feel good! Happy Friday all! I'm a huge stickler when it comes to my budget. Especially groceries and clothes. But since I've been dating, the dude has at least taught me a few things without realizing it- one is what Tony did. Gotta treat yourself on occasion. We're big fans of carryout and redbox movies, but we also have plans in the near future to hit up a steakhouse and go shopping for running shoes together... Life's too short not to enjoy a big meal on occasion. Cheers to the weekend, my friend! It's moments like these that your kids will remember when they're older and have kids of their own (they won't know of the expense, they'll just know they're parents were awesome that day!). I struggle with this too. Not so much the cost of things, but the treats themselves, as I've been trying to lose a few pounds. It's been really hard not to feel guilty sometimes. I'm working on it though! Also, that So Delicious ice cream really is so delicious. Girl - we are sisters I swear. I am so hard on myself, so rigid with my plans that I forget to treat myself. To stop and just enjoy. It's something I'm working on and getting so much better about. I'm glad he got that ice cream! I love you guys. I love that Tony wanted to do banana splits, I love how selfless you are (although sometimes girl, STOP IT :) ), and I just love so much that this became lunch. I agree with Heather - this will be one of those things the boys will recall fondly, for years. That's funny...I actually feel like having Lila has made me MORE go with the flow-- our days just are what they are, you know? I kind of know not to get attached to any one plan, ha. Oh my gosh, I am smiling SO BIG right now! I wish I could have seen the look on the boys' faces when they came down and saw the spread! So glad you guys were able to find some joy throughout the tough time you've all been going through. It's so important to do little things like that to give ourselves a boost when we need it. And you know, I bet the boys will remember the day mom and dad let them have ice cream for lunch for years to come! I still remember my mom doing special stuff like that when my sister and I were kids...eating "picnic style" in the living room floor, nights she declared "Heather" or "Tori" day where she would fix our favorite meals, or my favorite, the nights where we got to have breakfast for dinner! And to this day, I make sure to do things for myself every once in a while just because...whether it be a foodie treat, a shopping trip, or even a massage! Love this message Sarena. Treat yourself. So true! I'm so with you on bringing my own things to restaurants by the way. We'd make a good going out to eat team. Ha. HUGS! i agree I am a huuuuge budget fiend, but over the years I've learned that sometimes saying yes to little things is truly a massage for the soul :) plus you made him happy too!